Would you like to build your skills and experience by taking part in a hands-on creative placement. Are you interested in giving back to your community by volunteering with a local charity? Consider volunteering with Lewisham Youth Theatre. What Is Lewisham Youth Theatre? 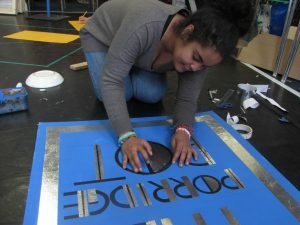 Lewisham Youth Theatre (LYT) is a registered charity based at the Broadway Theatre in Catford. We have delivered free drama projects with young people in Lewisham since 1987. We do not audition, and everyone is welcome. These roles particularly suit students, recent graduates and those interested in developing careers in the creative industries. Directing Assistants usually commit to 2 hours per week on placements from 6 weeks – 5 months. Design and Backstage Assistants commit to supporting productions more intensively over a 2 week time period. How do I contact LYT?